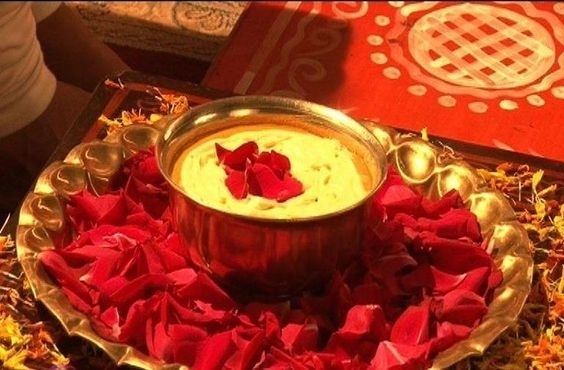 Haldi, also known as Uptaan, is one of the most ancient parts of the Indian wedding traditions. According to Indian rituals, the Haldi ceremony is celebrated the day before the actual wedding ceremony. American brides often have this ceremony a week before their wedding day. On the day of the Haldi ceremony, the haldi paste (made from turmeric and water) is applied to both the bride and groom by their relatives and friends. Historically, this ceremony is celebrated separately in homes of bride and groom, but nowadays, it is often done together. During the Haldi ceremony, the married female relatives of each household apply haldi on both bride and groom along with water. The haldi ceremony is said to remove any nervousness from the groom, as well as, bless the couple with fortune and prosperity. Turmeric, a natural exfoliate, so it is also applied to the bride's face so she will have sparkling skin for her wedding day. The bride's hands should be covered so the haldi doesn't interfere with her mehndi. Some people also add aata (flour) and rice to the Haldi, but that depends on which regional rituals you are usually follow. After the paste is allowed to dry the bride and groom shower (separately of course) and emerge glowing and ready to be married. 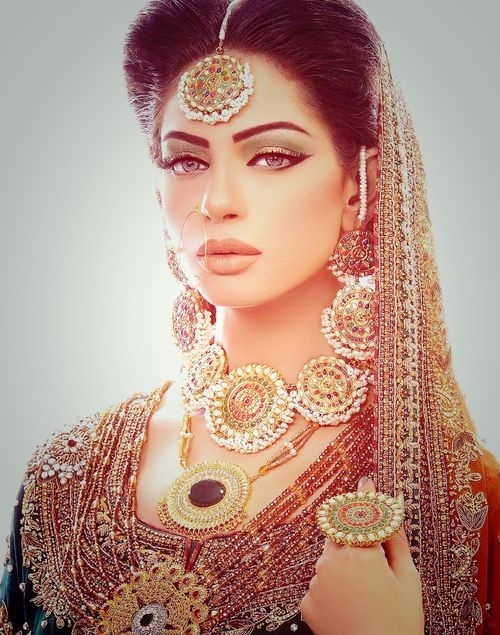 Jewellery describing the Wedded Status of Indian Women.. The wedding customs and rituals in India vary from state to state. But did you know that women in different parts of India wear particular ornaments to declare their marital status? Let's look at the diversity in various cultures within the country. In most cultures it is the Mangalsutra which signifies the married status of women in India but the mangalsutra itself has a number of variations. It is an important part of Hindu weddings and symbolizes a bond of love. The tying of the mangalsutra is more of a social practice than a religious one which originated in south India and later travelled to north India. The term mangalsutra comprises of two words- Mangal which means sacred and Sutra means a thread or a cord. Thali South Indian Bridal Jewelry:- In south India, it is known as Thaali. This is a thick gold cord with a gold pendant. The design of the pendant varies from community to community. Most times the pendant would have designs of goddesses or religious symbols with family crest or family monograms. Telugu brides wear two Thaalis. One is plain gold chain with a semi-circular pendant while the other is a chain with black beads. In Kerala the pendant is in the shape of a banana leaf which is considered very auspicious in the region. The Christians from Kerala have a cross embossed on the banana leaf shaped pendant. The night before the wedding, the groom's aunt extracts seven threads from the wedding saree and strings the pendant known as Minnu on to it. This serves as the Mangalsutra on the wedding day for a Christian Keralite bride and the silk threads are later replaced by a gold chain. Konkani women wear a gold chain with coral beads and a Lakshmi pendant known as Kasithaali. The Lakshmi pendant signifies the bringing home of a goddess. In Karnataka, the Bunt community emphasize on the wedding ring. It is a v-shaped ring unique to the community known as Vadungila. In northern India, the most common and mandatory custom followed by married women is wearing the sindoor. Women from Bihar wear a black beaded chain with a gold pendant which is similar to the mangalsutra but is known as Taagpaag and toe ring known as Bichwa. In Maharashtrian community the mangalsutra comprises of two gold semi-circular hollow spheres known as Vati and the cord comprises of black beads interspersed with gold chain. The black beads are supposed to protect the couple from evil and unfavourable influences. Bengali women wear a set of three bangles on each hand. Each set comprises of a red coral bangle, a white shell bangle and an iron bangle. They also wear sindoor which signifies their marital status. Gujarati women wear a nose stud to signify their married status while both Gujarat and Rajasthani women wear mangalsutra with diamond pendant. Women from Himachal Pradesh wear special Suhagi jewellery gifted to them on their wedding day while Kashmiri women wear ear ornaments known as Dejhoor as a symbol of wedded status. Though each region has its own rituals and customs there is some commonality and overlap between various cultures and even though the wedlock status is symbolized by different ornaments its significance remains the same.